THE Northern Star will be hot hot HOT this Friday night when ROCKBOTTOM JAMES & THE DETONATORS brings door-slamming, rubber-burning, jump-rock blues to Hamilton. Supporting the Melbourne-based roots rockers will be the Hunter's own JOHNNY GREEN'S BLUES COWBOYS. 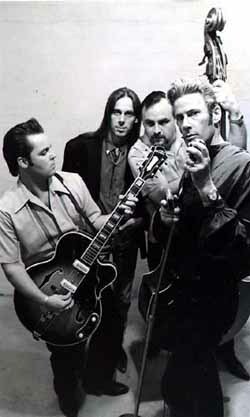 Since forming in 1997 The Detonators have released two albums through BLACK MARKET MUSIC and toured the east coast of Australia extensively, from as far south as Hobart and Adelaide to far north Queensland. The flat-chat rockabilly of The Detonators is laced with extra serves of twanging, slapping, roots rock'n'roll, sprinkled down with classic blues. The Detonators are PAUL BIGNELL on fat hollow-bodied guitar, DAVE PHILPOTT on slapping bull fiddle bass, TT SLIM on shuffling stick and skin work, with Rockbottom James performing his on-the-button vocals and top-fuelling electric harmonica.